EVER WONDER HOW QUESTIONABLE MOVIES GET MADE? 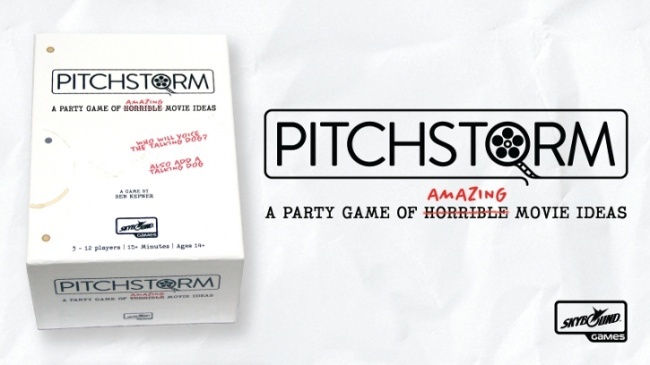 Skybound Games will release Pitchstorm, a party card game about pitching improbable movie ideas, in late Q4. The game is currently seeking funding on Kickstarter. 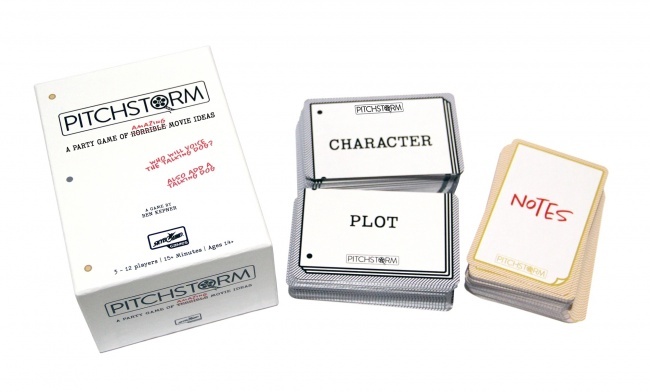 Pitchstorm has players take the role of a unprepared writers pitching movies to a studio executive (aka another player). Each round, players take turns acting as the executive, carefully considering the ideas, and giving notes to every pitch. Each writer draws either three character cards, or three plot cards, and chooses one as their basis for a movie. Then when its time to pitch, they draw a random card from the pile to complete their movie, which they then have 45 seconds to pitch. At any time the executive can stop the time and interrupt to add some terrible ideas (notes) to the presentation. No matter how outlandish, the writer must work the notes into the story. After all players have pitched, the executive decides which movie they like best, and award a point. The game can also be played with a large group of 6 – 12 players, with people working as teams (including as the executives). MSRP for the base game is $30.00. Several expansions: Creature Feature, Date Night, Awards Season, NC-17, will also be available for $15.00 each. The Kickstarter met its modest $5,000 goal on its first day, and will continue through July 13. There is a retailer level (Theater Owner) for a deposit on 6 or 12 copies of the Kickstarter version of the game. Fulfillment is planned for November, with retail release planned for PAX Unplugged (November 30 – December 2). Skybound Games is an imprint of multiplatform entertainment company Skybound Entertainment, best known for the long-running comic, The Walking Dead, as well as other print media, TV, film and digital content. Skybound Games is the home of party game Superfight and Red Flags. The company recently acquiring Druid City Games and hired creator/owner James Hudson as Senior Director of Tabletop Games (see “Skybound Entertainment Hires James Hudson”).